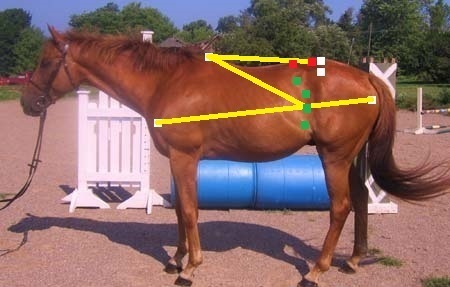 The loin is arguably one of the most important structures in the horse. It is inherently weak in its design, being a freespan (having no ribs to add support and strength), and therefore is susceptible to injury. The loin of the horse is equivalent to the transmission of a car; it transfers power created by the haunch (engine) forward. A mismatch of a powerful haunch (engine) to a weaker loin (transmission) all but guarantees ‘spinning tires’ and often structural failure. The shorter the loin is in length, the more strength it possesses. The deeper the loin, the more strength it possesses. The broader the loin, the more strength it possesses. The strongest loin is therefore a short, deep, broad one. This type of loin is virtually indestructible and guarantees full transmission of haunch power brought forward, but can produce a rough ride if it gets muscle bound. Think of it in terms of a body builder with their massive strength, but often times lacking flexibility. A horse with this loin absolutely must have a training focus on creating and maintaining suppleness. Of course we now know that how far the ribcage carries back plays a role in lateral flexibility. A short loin guarantees ribs that carry back well for lateral flexibility, so the potential for suppleness is clearly there with a short loin. The weakest loin is a long, shallow, narrow one. This type of loin is highly susceptible to damage. It can combine with other traits to make a rather smooth ride because the horse that possesses it often hollows the back and becomes a leg mover, but invariably it breaks down under anything but the lightest of workloads. Six lumbar vertebrae make up the loin. There is no specific loin measuring system in terms of garnering a specific percentage. We use various body references to determine its length. 1) The ‘quick and dirty’ hand measurement discussed in the Part 2b – Ribcage article. Greater than a spread hand’s width (8″) and the loin is long; about a spread hand’s width and the loin is medium, and less than a spread hand’s width and the loin is short. 2) The loin should ideally be as deep as the chest. A significant difference and a loin is very likely long. Note: Excellent riding and training can deepen and strengthen a loin. 3) The further behind the point of hip that the LS joint is, the more likely the loin is long. 4) Probably the most telling view for the loin is a top down view. Marking the points of hip, the LS joint and the first lumbar vertebrae, then connecting the points (minus the LS joint) will produce a triangle. An equilateral triangle with the LS joint inside the base line would be a short, broad, deep and strong loin, whereas an isosolese triangle is going to indicate a longer, less broad, less deep and therefore less strength. Let’s take a look at our six horses, concentrating on their loins. Horse #1 – QH stallion: This is a short loin with great depth. We don’t have any overhead shots of our horses, but if we did this horse would also be broad across his loin. Our horse with the biggest hip has a loin of more than sufficient strength. 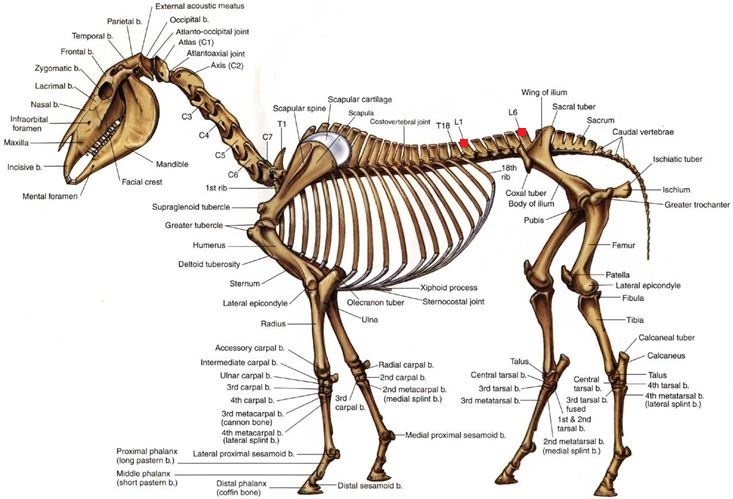 Horse #2 – QH gelding: This loin is longer than our first horse because the LS joint is placed further back. If it was placed in the same location as our first horse, the loins would be identical. Still this loin remains medium in length and has excellent depth and breadth. Horse #3 – 4yr old QH: This loin is also medium in length, but just. It’s not as deep as our first two horses, but likely possesses good breadth. Horse #4 – Arabian Stallion: Another short, solid loin. It lacks a bit of depth, which I blame on the table top croup preventing engagement. Horse #5 – TB Gelding: The shortest loin of our group. It has good depth (don’t let the distended belly fool your eye). This is another one that likely isn’t particularly broad and thus why it isn’t as deep relative to the shortness. Horse #6 – Paint mare: Here we have a long loin that lacks significant depth and likely breadth as well. This is a highly susceptible construction and we can be thankful that she doesn’t possess the same kind of hip as our first three horses or she’d be in big trouble. Based on what we have analyzed so far; hip, back, loin, lumbo-sacral joint, ribcage, to a lesser degree the withers, and setting aside any personal or breed biases, or anything else we might know or suspect about the individuals in question, how must this group of horses be ranked? Before you peek, think about it. Which horse at this stage seems to have the most athletic potential AND ability to stay sound through the back and loin doing whatever task they may be asked in the future…all other things being equal and relative. And who appears to have the least? And why? 6. Horse #6, Paint mare. Her back is long, her loin is long, her ribcage does not carry back well, and neither do her withers. She possesses adequate hip length and might very well produce some easy gaits to sit to by means of hollowing the back and being a leg mover. Of the group, this horse requires the most knowledgeable rider to prevent topline breakdown and improve its strength. 5. Horse #4, Arabian Stallion. There is just no getting around the table top croup, it’s just that severe of a fault and the camel withers don’t help. 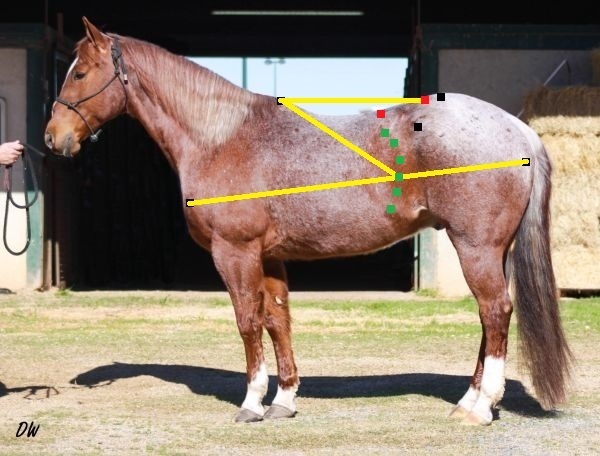 What saves this horse from breaking down through the topline are the shorter back, the short loin and the ribcage that carries back well, all of which add significant structural strength. While this is no novice ride, this horse is far less likely to succumb to topline breakdown from hollow riding than our Paint mare. For that reason he garners one spot up from the bottom. 4. Horse #2, roan QH gelding. Simply based on having the poorest LS joint placement of the remaining candidates, increasing the difficulty of engagement. The next two placings are very close and arguments can be made for switching them based on discipline and type of issues a person prefers to deal with. Tie for 2nd – Horse #1, QH stallion and Horse #3, grey QH gelding. Our stallion is shorter backed, has a short, deep, broad loin, a huge hip, a good LS joint placement, and ribs that carry back well giving us super longitudinal strength, super power potential, super potential to engage, but perhaps lacking a bit of lateral flexibility through the body compared to the grey gelding with a longer (yet still medium) back, a medium loin (that does lack a bit of depth), a big hip, a very good LS joint placement and ribs that carry back well. His withers aren’t as well defined or designed, but still functional. This one may possess a bit more flexibility, but also may tend to evade through the body more. Still plenty of power and engagement ability, this one might very well ride a bit smoother. 1. Horse #5, TB gelding. The horse with the least hip length currently heads our list because there is so much strength in the rest of his topline that that lack of pure power can be overlooked – as long as we’re not going to ask him to be a sprinter, or an International/GP competitor. He has a great short loin and LS joint placement, withers and a ribcage that carry back really well to add longitudinal strength to the medium back and should possess a good amount of lateral flexibility as well. This horse should present as the most viable individual, for the most people, with the widest range of knowledge and ability. There is not so much power or movement potential that a beginner/novice couldn’t handle this horse, and yet there’s enough longitudinal strength to protect the horse against that sack of potato rider. Additionally there’s plenty of lateral flexibility and engagement potential that a more advanced rider could also enjoy this topline. For those reasons this horse takes the top spot – for now. We’ve only just begun our analysis of this group of horses; there’s so much more to look at and consider. I suspect *wink* that the current rankings may change as we delve deeper into the conformation of these individuals. Will your original choice end up at the top of the list? (Insert appropriate musical cue) Stay tuned for the next series of articles discussing body levelness and shoulders. This entry was tagged conformation, loin. Bookmark the permalink. Personally, I would place Horse #1 – QH Stallion ahead of (in 2nd place) Horse #3 – Grey QH gelding as my experience has taught me that strength of loin outranks lateral flexibility and I’m more willing to deal with a shortcoming in the lateral flexibility department than I am in loin strength. I also don’t place the same importance in overall ride quality in terms of ‘bounciness’. I am willing to accept a less smooth ride (a horse with more hip action, a horse with more thrust) to gain loin strength or some other trait of equal importance. I’m still liking that quarterhorse…. it’s only the 2nd one I’ve ever seen that I liked so it comes as a surprise. Great post. Drawing the line from point of shoulder to point of rump makes depth of loin (and heartgirth, shoulder, gaskin very apparent. I’m going to reverse the order of the QH stallion and gelding, for my experience tells me the stallion will be a rougher ride and harder to put together with his rump in thin airspace. For loins, I pick the TB but going to hang tough with the grey as my first overall choice, TB second with the roan a close third. The QH stallion may win the race and the roan may rope and hold the biggest cow but the grey looks multifunctional. He has the better pasterns, neck, throat-latch and has better hock angle than the roan. I can’t judge the Arab as he looks like a halter horse only, I see him dropping leads behind like crazy. The Paint is just a mess, poor girl. That said she could very well have the best work ethic of the bunch! Reins self in…..ok, other than reversing the stallion and grey gelding, I’m going with your picks on loin strength. You picked a good variety of horses….each unique in conformation, potential use, and strength. Did you notice I have an overall favorite already? (:-) One question though, in determining loin breadth, is there also a correlation to the rib cage and stifle width? 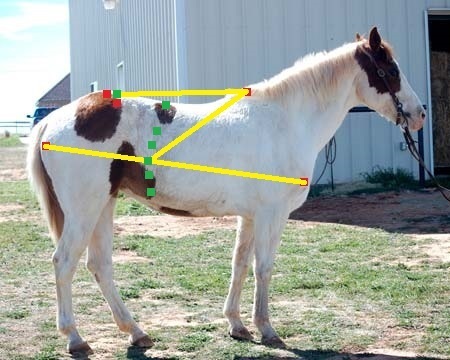 Is a slab-sided horse more likely to have a weak (narrow) loin also? Not necessarily and no on the ribcage and stifle, respectively. I really wish I had overhead shots to go along with these… In an overhead shot we’d be marking the points of hip (not stifles), the LS joint and L1, connecting the hip and L1 points and then looking at the shape/type of triangle that’s created, along with where the LS joint is located in relation to the line created between the points of hip. 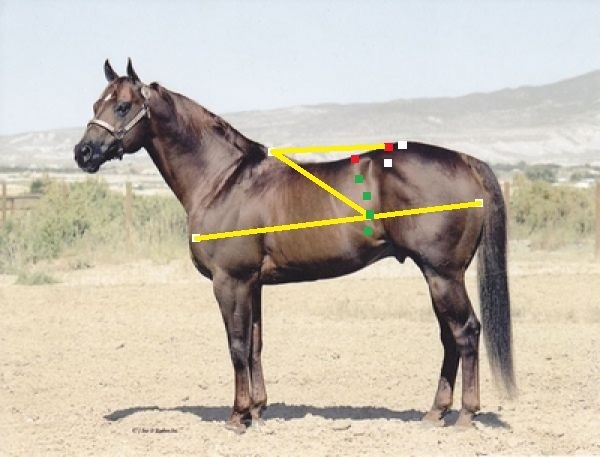 The TB gelding is not going to be as broad through the body as our QH’s and yet has either as deep a loin or deeper (in case of the grey QH). He’s broad relative to his own body, but not to the QH’s. All the previous lines and dots on the pictures are making it hard for me to determine what exactly it is I’m meant to be looking at. I know the general region, but figuring out exactly which of the various points I’m meant to draw a mental triangle in is confusing. It would really help if the area of the loin were shaded in the pics for this discussion. Just a thought. I’m really enjoying this series on conformation, and I want to get as much out of it as I can. Look at the skeleton picture and you’ll see where I’ve marked the loin. 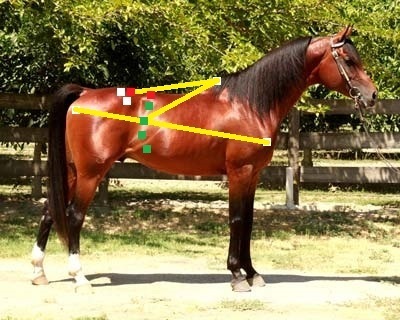 That is your reference point for the loin itself in the photos of the horses. Mercedes, if you have the opportunity/interest, I’d love to hear more from you on leg movers vs. back movers. Thanks for the wonderful post! Okey, dokey…I’ll put it on my list. Continue to be impressed by your knowledge and way of making complicated things easy to understand. I remember when you posted on fugly that she should quit trying to do conformation critiques. Now I understand why! Thought it was kind of bitchy at the time but now I understand that it was like a kinder gardener trying to teach calculus. Thanks for teaching me something I didn’t know! Keep up the good work. Thank you, as always, for the kind words. I didn’t (and don’t) hold any bitchiness against you. 🙂 I did say that. It was the perpetuation of myth, and the focus on the unimportant that irked me because it doesn’t help people pick a better and more suitable horse, doesn’t help people understand what’s going on with the horse and therefore doesn’t help the horse. I’m really tempted to go take pictures of all of the horses at my barn and just analyze the crap out of them. I could use the practice, and it could be wicked fun! We have lots of different breeds and ages. All of them used for dressage or jumping save just a couple. It would be interesting to take that variety and really look at them and see which are more suited for their disciplines and why. And to see how my (likely flawed) results match up to how well I do know they do. Well, you’ve got me and everyone else here to pick brains. It’s an opportunity to discovery why each horse has its own niche, why individuals struggle with certain movements, while others excel. It’ll give you incite into how to train/ride each of them. Your choice, I’d be happy to help. Well that cinches it, I’m doing it 😀 There are a couple of horses out there that are good at disciplines I wouldn’t have thought they’d be good at, it will be cool to learn just what part of their conformation is allowing that (like a Morgan and a Lipizzaner being excellent jumpers). I won’t be able to nab pictures until Sunday, but I’ll do my best to get good ones. Morgans and Lipizzaners would generally make quite nice jumpers. Both breeds tend to have exceptional loin and haunch conformation to be able to power them over jumps. Both breeds also tend to have front end conformation that would allow for relatively good jumping form. Well that would explain it. I’ve never though of them as “jumping breeds”, then I rode them for my jumping lessons and loved it. It would explain why my barn has an arsenal of Lipizzans all dedicated to jumping, haha. I am getting caught up – I love these conformation posts. Thanks! Hi there! I just love your confo posts! But I have a question… According to your dots on the paint mare, it appears she has pretty good LS joint placement as the LS joint sits right over the point of hip (even better than the roan). I can see her long loin based on the “stretch” between her ribs and hip (already showing strain there) so I realize she isn’t as strong through her top line as the others for several reasons, but I’m wondering if her LS placement counts for anything? Or are the dots are a little misleading on this mare? Also, how far ahead of the sacral tuber (hope I got that right) is the LS joint on average? They usually seem to lie very close to each other as far as I’ve noticed. Yes, she has a very good LS joint placement, which does count for something. If it was poorly placed, she’d have no hope of staying sound with your average horseperson. Her adequate hip, long loin and long back, though, are a worse combination to have (even with the LS joint placed well) than the roan’s big hip, medium loin and short back. She’s far more susceptible to topline stress than he is, even if he can’t engage as easily as she can. The sacral tubers are the top points of the pelvic bones that make up the point of croup (for those that don’t know – check the skeleon diagram). Their location is somewhat independant of the LS joint. Using their location on a photo can help locate the LS joint, but not the other way around. I’ve never seen an LS joint ‘behind’ them. Oh my gosh that helps so much! I have been struggling with the sacral tubers and LS for quite a while believing that they were in some way correlated to each other (though I know they are two separate parts completely, they just seem to go together). I guess it’s all about trade offs then… I’ve been trying to figure out my 3 yr old’s coupling. Her LS joint is behind her point of hip, but I believe she is short through the loin as her rib cage carries far back and she has pretty good pelvic length, but probably on the long side of medium-lengthed back. I tend to be overly critical of my horses I think, so I’m trying to determine how bad her coupling truly is. Obviously I would prefer better LS placement. 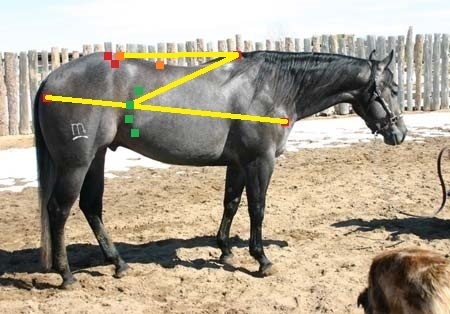 Because the pelvis can be angled (slope) differently for each horse and the tubers can be shaped a bit differently, they can be placed relative to the LS joint a bit differently. Yes, the horse is the sum of its parts. We start by examining each part separately and then considering the parts as a whole and how that effects the horse’s ability to function and stay sound. Consider that your horse is not done growing yet. Her top level bones (particularly the spinal vertebrae) are not done growing. If she’s longish through the back, but with a ribcage that carries back well, she should exhibit very nice lateral flexibility. She could have a short loin with good pelvic length. The LS joint behind the hip makes engagement a bit more difficult and drops some of the horsepower. She may be a horse who evades through the body. Glad you’re enjoying the blog! Happy to have you here. It depends alot on what part of the contruy you live in. I feed a real good quality Bermuda. You can also feed alfalfa. But that will probably just make him hyper. You feed the same kind of hay to an abused horse that you do a well cared for one. Tatoos mean he has a tatoo on his upper lip. Which is required to race with the jockey club. You can then look up his pedigree and racing stats. Has this blog moved somewhere else since 2014? Nope it hasn’t moved. I’ve simply been too busy in RL to add to it. I’ve wanted to get back at it for a while now, but something always seems to come up.